(The accompanying photo is not mine, and is probably copyright. And so to the Wild West, where a gang of five travel-stained renegades mosey into town one ill-fated misty night from the Bad Lands, their battered cowboy hats and long leather riding coats coated in the dust of the radioactive desert. 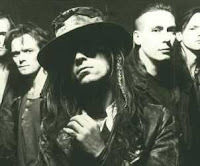 The Fields of the Nephilim are back. The Wild West in this case is West London, and the saloon bar they take over is the Shepherd's Bush Empire. Their posse are recruited from the leagues of the undead, paunchy cowboys, and the unselfconsciously Goth, who queue around the building to worship at the altar of the Cult of Preacherman and Psychonaut Carl McCoy. The support for the gig was a resurrection of Pagan/Goth/Rock band Inkubus Sukkubus who I thought had quite a good guitar sound going there (unless they were miming and it was part of the mixed backing track of drums and keyboard), with the lead guitarist in particular thinking he was at times Pete Townshend, and at others Jimi Hendrix (even playing his guitar with his teeth). The female vocalist (ok, quick peek in wikipedia, her name is Cadia Ridley) had quite a Siouxsie thing going and can't be faulted on her energetic leaping around the stage, but to my ears her voice was too shrill. The set-list wasn't too memorable, but they did do one called, I think, Paint It Black, which I'm sure I've heard before (heavy irony tags around that). I kept expecting Playground Twist or Happy House to break out, but sadly they didn't. Talking of black though, we were standing down in the stalls, on the raised bit by the cloakroom at the back. Watching the folks checking their coats in, I wondered how they'd get on if they lost their check-in slip. "How can you describe your coat? "; "Well, it's - er - black." (I'd be okay; I had depositied my olive-green East German Officer's Great Coat with red and gold epaulettes and DDR party badge, purchased near Checkpoint Charlie Berlin. I would bet a £1000 easy that nobody else had similar. I like to be different). Eventually the Neph came on stage at 9:30 (doors opened 7), and the rest of the evening ours ears were by turn soothed and assaulted by a rich tapestry of portentious minor key chords woven with exhilarating power guitar riffs and heartbeat drumming. The waves of complex sound were unrelenting, sometime interminably so (though never did the phrase 'never-ending funeral dirge' enter my mind. Okay, once or twice). The wall of sound built on itself and climbed to Bachian recursive complexities before finally giving us release in a crash of chords falling into silence (my self-nomination for 'Private Eye' magazine's Pseuds Corner). Underscoring the effect was McCoys deep vocal, hypnotic rhythm; a voice reminiscent of Ian Curtis , though thankfully McCoy didn't get anywhere near reproducing Curtis' epileptic dance-style (in fact, I don't think he moved at all throughout the set). The mosh pit were definitely dancing though, or at least waving their arms about and trying to go for the world-human -pyramid-and-crowd-surfing-at-a-rock-concert record. And what's with the inflatable clown fish? Dozens of Nemo's were being waved around for no logical reason. WTF, Goths are weird. This was one of the few events where you grumble about not seeing the stage because of the man wearing a hat in front. The only other event might be Glyndebourne. But really, even without the sea of distressed cowboy hats (and back-combed vampira bee-hives - some being sported by women as well), there wasn't a lot to see; unmoving cut-out figures dimly viewed through a fog of dry ice - was it really them? - but saying that, the dry ice was very nicely lit with coloured lights. No, it was the music that made this gig. I really didn't recognise more than about three tracks, but then taken out of the pristinely-produced album context and added to with maturity and technological advances, these weren't the tracks you ever listened to on your Walkman in the eighties and nineties. After a great evening, the audience dissolved back into the London night; to their crypts, ranches and, in our case, the Jubilee line and a long, tired, but satisfied journey home.